KL is well known for having beautiful hotels with amazing rooftop pools that have the best views over the vast city. Head to Instagram and look up top photos of Kuala Lumpur and you’ll more than likely come across many photos taken from various pools that look over the city. While in KL we had the opportunity to stay in two sister hotels, both with amazing rooftop pools with the best views! The two hotels were just minutes apart from each other and in the best location, extremely close to KLCC and both with views of the Petronas Towers. Definitely one of the best rooftop pools we’ve ever come across, the view from up at the top is just superb, with the Petronas Towers to one side and mountains in the other. The rooftop also has a well equipped gym and business centre, both with sweeping views of the city. All rooms here are apartments, from studios up to 3-bedrooms with kitchens and laundry facilities- making it even better if you’re staying for a longer period of time, looking to make your own food, or have been travelling for awhile and need to get some laundry done! You can’t find a better location than this one! It’s literally just a minutes walk from KLCC, which includes the Petronas Towers and Suria KLCC (a fantastic shopping mall)- this means anything you could possibly need/want is within a very close distance. This hotel also has an incredible rooftop pool with similar facilities to the other location including a gym and business centre. 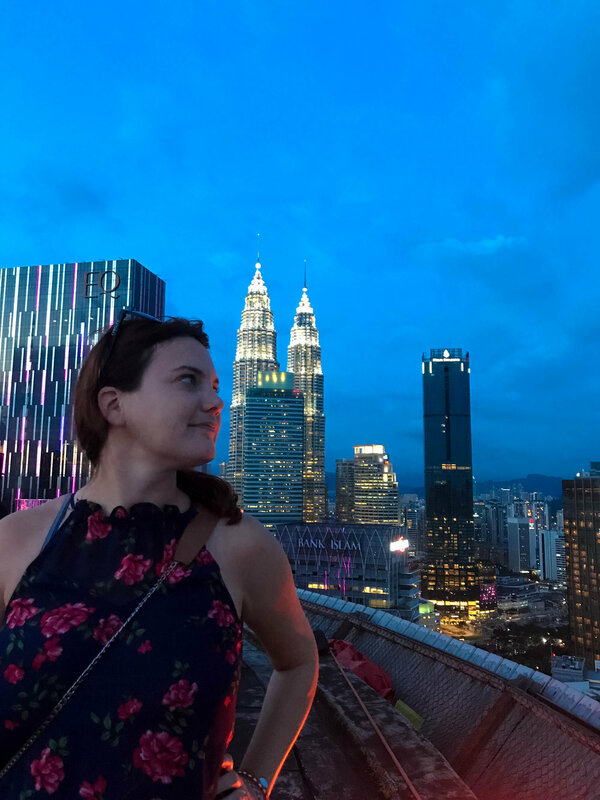 Although we’d say the view isn’t quite as magnificent as Somerset Ampang, it’s still pretty fantastic (you can easily see the KL Tower and the Petronas Towers), and whatever it lacks in views (which isn’t much) it more than makes up for in location! Rooms here are also apartment style, we stayed in a one-bedroom executive apartment which felt so spacious and well equipped with a full kitchen, dining room, living room, huge master bedroom with a walk-in closet and bathroom with separate shower/tub. If you come to Kuala Lumpur and don’t visit a hotel with a rooftop pool, you’re definitely missing out on the full KL experience! Have we mentioned you can find some really fantastic views in KL? Well Heli Lounge Bar is a rooftop bar that happens to be a helicopter pad by day, and a rooftop bar by night! Although there is an indoor bar that opens at 5:00 pm, if weather cooperates you can’t miss out on the outdoor rooftop- when we visited it didn’t open until 6:00 PM - so arrive early, grab a drink at the bar and wait inside to have first dibs when the pad opens up. If you’re going with a big group, or planning on having dinner, it’s not a bad idea to make a reservation in advance. Also take note that there doesn’t seem to be any outside signage on the building, we asked at security and they directed us up the elevators. The Petronas Towers have got to be two of the most spectacular and iconic twin towers in the whole world. While they are gorgeous during the day, they really do come to life at night when they are all lit up. After sundown we visited right in front of the towers (by the fountains) where you’ll find loads of other people trying to take selfies with the recognizable towers. We did hear rumours that the views of the towers are even better in the adjacent park so be sure to check that location as well. This may sound like an odd suggestion (as a North American) but Asia in general is known for its epic malls, and Malaysia is no exception. We’re not quite sure why they seem to be obsessed with having the biggest and most incredible malls but it’s definitely a thing and you’ll want to check it out while in KL! We visited two malls while in the city, Suria KLCC which is many, many floors of high end fashion with pretty much every brand you could ever want, we also ate here a few times. Again, as a North American we may not consider a mall food court as a destination for good food, but you’ll find lots of local favourites as well as many international dishes, all at a really affordable price! We also visited Berjaya Times Square, which feels a bit less high end and less touristy than Suria KLCC, but also boasts many, many floors of stores, a great food court and a theme park with a roller coaster! 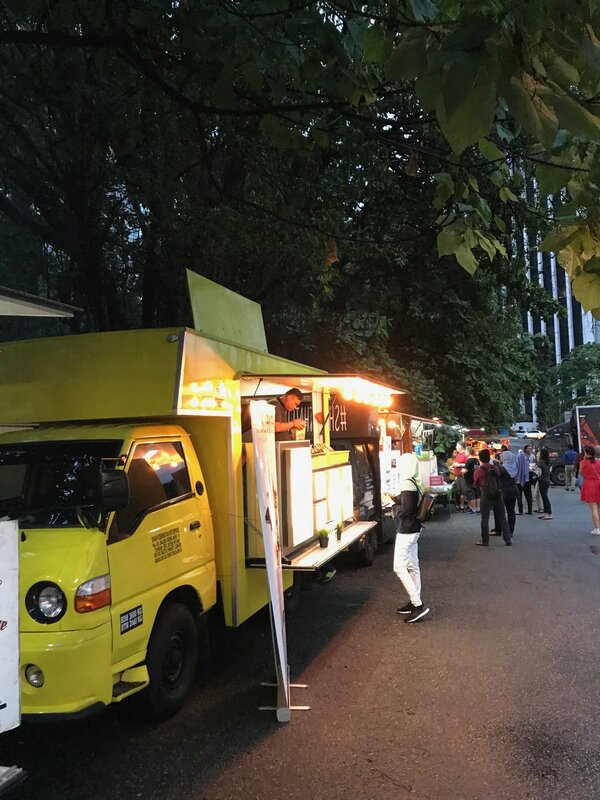 We’re by no means suggesting skipping the local night markets in KL, but we had a great time at Tapak Urban Street Dining in central Kuala Lumpur. This is a food truck park at its finest. You’ll definitely find some great local dishes but you can also dine on some western favourites such as burgers and burritos. 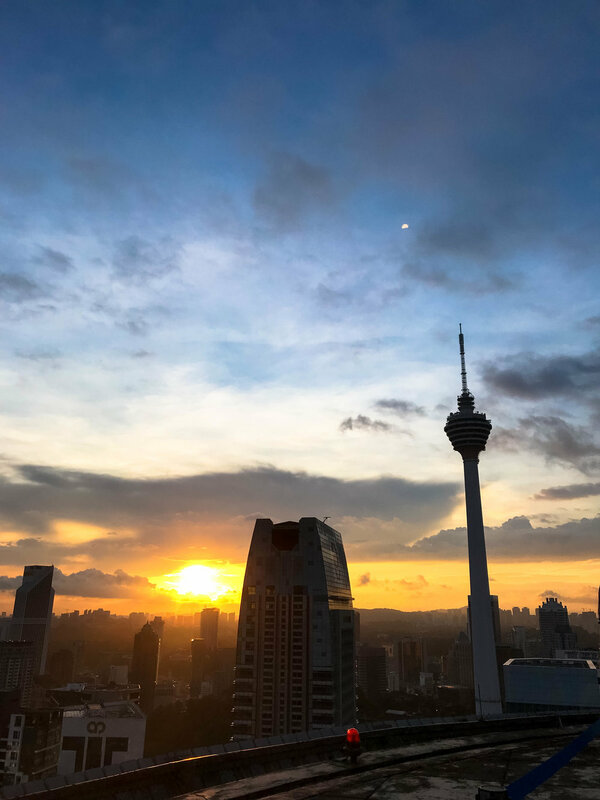 You’ll also find yourself super central in KL, which means at night time things light up, and you’ll be surrounded by vibrant buildings including the Petronas Towers. What is your favourite thing to do in Kuala Lumpur?